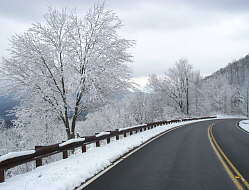 Recent Snow along the Skyway. 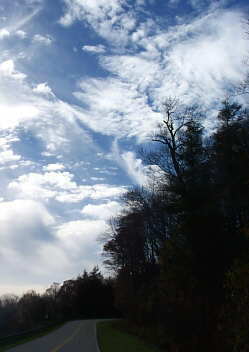 Late Afternoon Sky along the Cherohala Skyway. 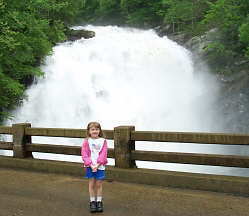 Bald River Falls During 2003 Flood. 1863 - 1st US newspaper printed on wood-pulp paper, Boston Morning Journal. 1870 - Donkey 1st used as symbol of Democratic Party, in Harper's Weekly. 1907 - 3-element vacuum tube patented by Dr Lee de Forest. 1919 - 2 million gallons of molasses "Tidal wave" Boston MA, drowning 21. 1936 - 1st all-glass windowless structure in US completed, Toledo, Ohio. 1951 - "Cloud of Death" rolls down Mount Lamington, New Guinea kills 3-5,000. 1965 - Rock group The Who releases 1st album "I Can't Explain"
1990 - 42 year old George Foreman KOs George Cooney in 2 rounds. 1998 - NASA announces John Glenn, 76, may fly in space again. 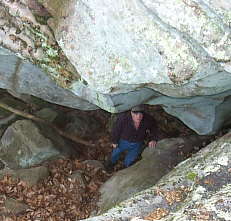 Entrance to the Cave That the Hermit Mason Evans was Believed to have stayed in on Starr Mountain; During the 1800's. 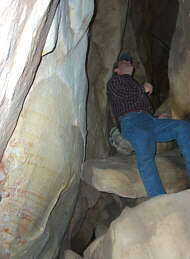 Inside the Mason Evan's Cave. child and infant CPR courses Saturday, Jan. 17th, call 442-9099 for info and to register. 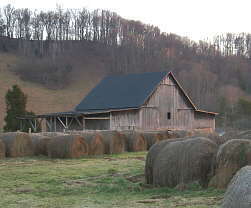 Sundown at an Old Barn Near Chilhowee Lake. Thought For The Day - " While forbidden fruit may be sweeter, it spoils faster. "